DO YOU WANT TO RESERVE A SPOT FOR YOUR CHILD? If you would like to reserve a spot for your child, your first step should be to call our Director, Donna Andreoni at 630.357.4836. Spots are limited and fill up quickly so please be sure to give us a call. 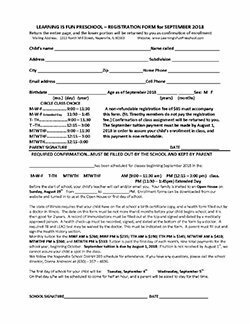 2 – Completing the Learning Is Fun Registration Form – which you can print off by clicking on the image to the right. 3 – Completing a number of other state required forms. You can find these additional forms by clicking on menu under Resources. 4 – And of course registration is not complete until we’ve received your registration form and payment. As always, should you have any questions, please do not hesitate to give us a call!